Indigenous Land Defence Across Borders hasn't added a story. Thank you for visiting the fundraising page for the Indigenous Land Defence Across Borders project (ILDAB). ILDAB is a grassroots, feminist-led initiative to build greater relationships between Indigenous nations & communities on Turtle Island and Palestinian communities. As part of the project, a delegation of five Indigenous women will be traveling to Palestine in the summer of 2018 to connect with local organizers and civil society organizations. Following the summer 2018 delegation, the project will be arranging for two delegations of Palestinians to visit Six Nations and the Six Nations Land Reclamation site; one of the delegations will be local, and the other delegation will be of Palestinians living in Palestine. ILDAB's goal is to educate our respective communities and build the global network to raise awareness and respond to colonial confiscation, resource extraction and forced expulsions. What will the funds be used towards? The funds raised will be used to cover the costs of the delegations. This includes: flights, accommodation, ground transportation, translators (where required) and materials for educationals. The estimated cost of the project is actually $32,000, but thanks to the strength of word-of-mouth fundraising prior to launching this FundRazr and a small grant, we were able to raise an initial $16,000. ILDAB is partnering with No More Silence (NMS). NMS has kindly agreed to administrate the ILDAB project funds. NMS, founded in 2004, aims to develop an inter/national network to support the work being done by activists, academics, researchers, agencies and communities to stop the murders and disappearances of Indigenous women, girls, trans and two spirits. Together with members of the February 14th Planning Committee, the group has been holding a strawberry ceremony on Valentine’s Day to commemorate the deaths and disappearances of Indigenous women, girls, trans and two spirit people at police headquarters in Toronto for the past 13 years. This year’s event was attended by over 1000 people. Unfortunately, donations are not tax-deductible as NMS is not a registered charity. What happens after the delegations? Delegates will return to their communities and participate in events where they will have an opportunity to relay their experiences and educate others about the links between settler colonialism, racism, capitalism, imperialism, and hetro-patriarchy across borders. 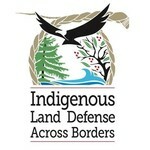 Indigenous Land Defence Across Borders hasn't posted any updates yet. Indigenous Land Defence Across Borders is managing the funds for this campaign.